Growing up in chilly Canada, Johanna and Derek MacMinn longed for warmer climates. 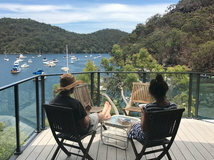 They moved from Nova Scotia to Noosa, then to Brisbane, Sydney and back again to Queensland. 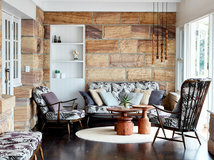 They settled in a cosy Queenslander just west of Brisbane’s CBD. 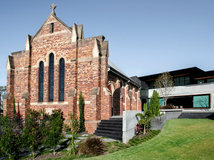 The home’s location was ideal – close to the river and surrounded by parkland and bush. 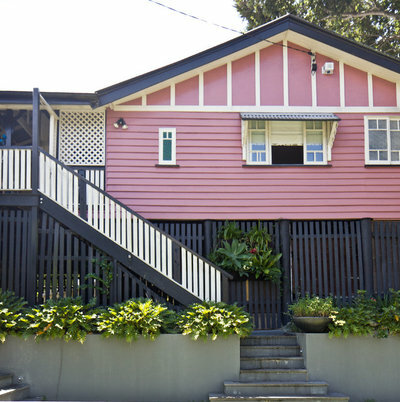 Johanna and Derek set about transforming their new pink home into a family home, repainting the entire space, updating the kitchen and filling the verandah with lush greenery to create a contained jungle in which to while away the days. 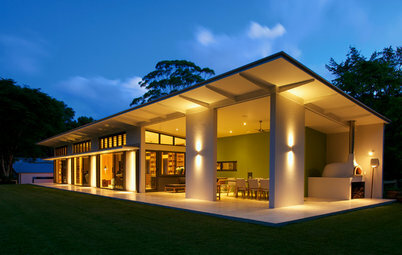 They now have a breezy home that reflects their love of the outdoors and the Queensland climate all year round. When Johanna and Derek were in the market for a place to call home in Brisbane, their vision was clear. 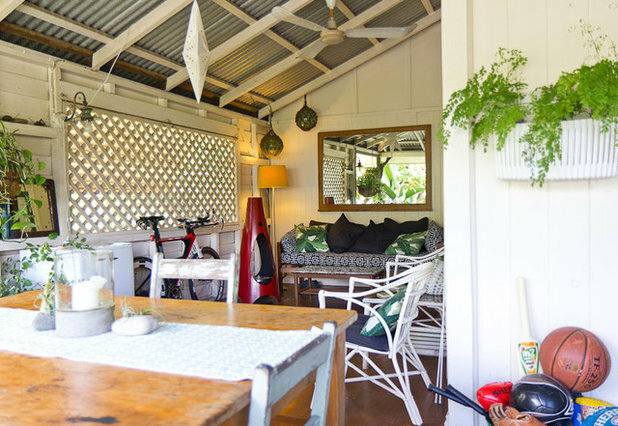 “It absolutely, without a doubt, had to be a Queenslander home, with an L-shaped verandah,” says Johanna. 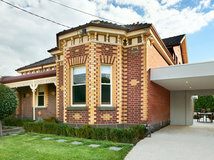 They eventually, stumbled across this spacious home that ticked all the boxes. 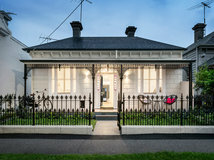 The exterior of the house was painted in a bright pink when they bought it, and although they wanted to create a more neutral palette inside, they chose to keep a flash of colour on the outside. Johanna says she likes that everyone knows theirs as the pink house on the corner, and that the paint was in such good condition when they bought it she couldn’t bring herself to change it. “Also, my neighbour hates it and the devil in me enjoys taunting him for no particular reason,” she says. 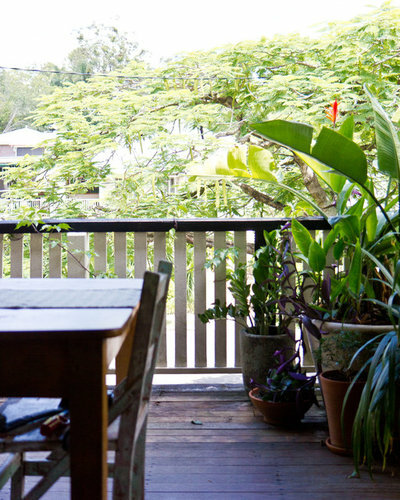 The verandah is the place to be throughout the year, thanks to the subtropical climate in Brisbane. 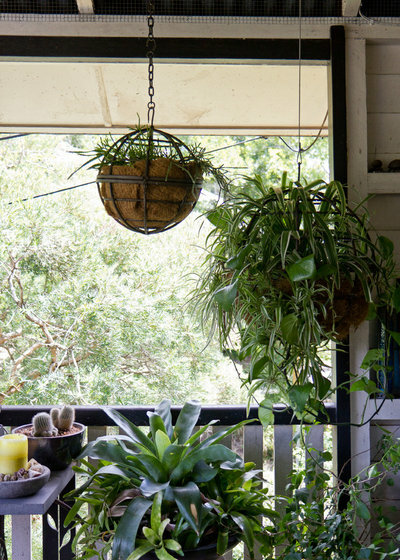 Johanna has put her green thumb to good use in this area of the home, turning it into a contained jungle. 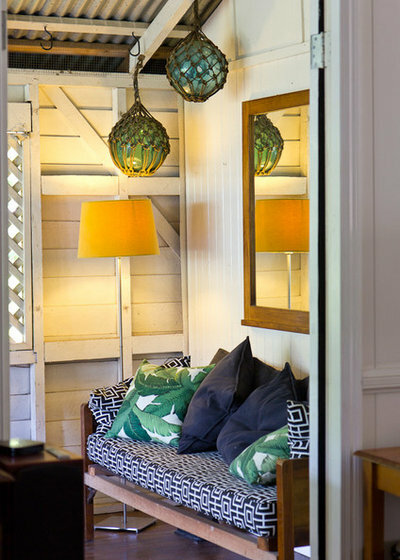 At the far end of the verandah, an enclosed outdoor living room is filled with comfy furniture packed with cushions for family and friends to gather around. In the cooler months, the family can warm themselves around the fantastic Modfire that heats up a surprisingly large space. Johanna found the hanging floaties and the daybed at a garage sale. The seller’s family had found the floaties in the 1960s. Johanna spotted these unwanted chairs at the side of the road and brought them back to life with a lick of paint and soft furnishings in nature-inspired hues. 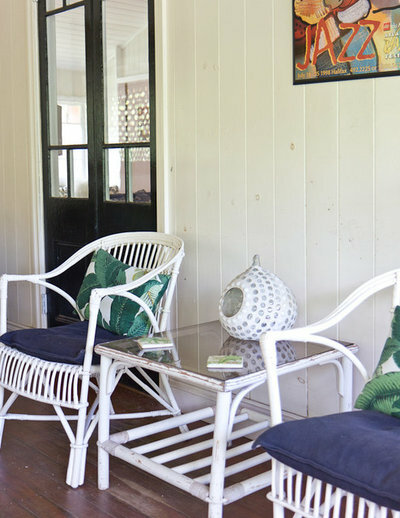 At the other end of the verandah, there’s ample space for entertaining with space for dining outside. The table also provides a quiet place to catch up on emails, and is an ideal place for Jack to get on with his homework. 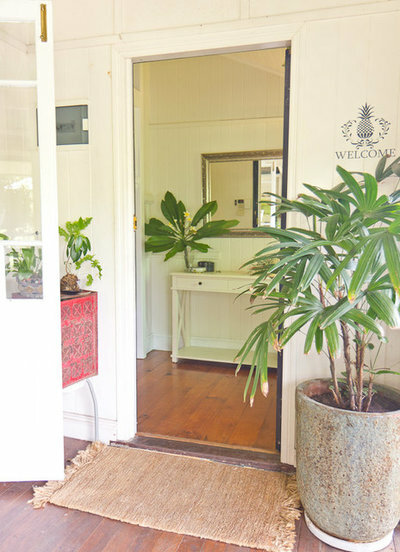 Johanna’s love of bringing the outdoors in can be seen not only on the verandah, but at the front door where guests are greeted with smatterings of green. Jo recalls purchasing the trio of vintage Danish lights from Born Vintage Collectables & Old Wares in Braidwood. Holding onto them for 10 years, Johanna knew that one day they would become part of her home. 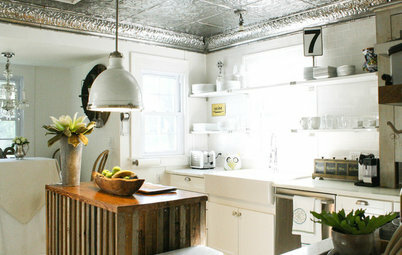 Now hanging over the kitchen island, they fit into her eclectic decor perfectly. The home underwent minor renovations, for most of which Johanna and Derek were hands-on. 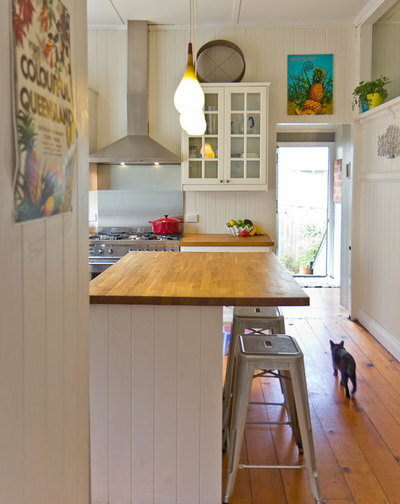 With the help of a friend, who had once been a cabinet maker, Derek took to the kitchen renovation. “It took them longer than they thought but they did a great job!” says Johanna. 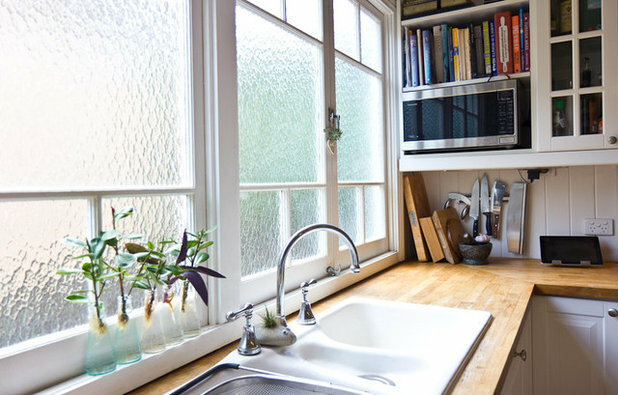 Everything in the old kitchen had to go except for the beautiful enamel sink, which still takes pride of place today. 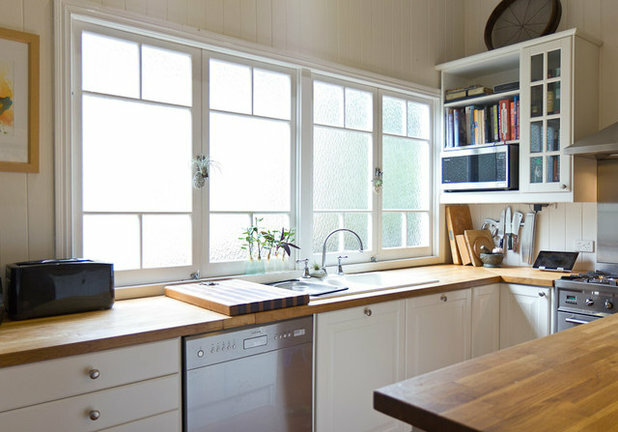 The old cabinets, benchtops, stovetop and tapware were all replaced. 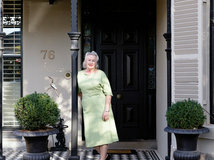 Johanna’s design studio is the hub of her landscape architecture business, My Verandah. 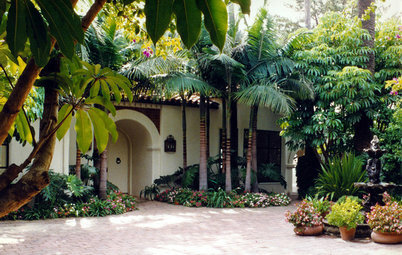 The studio was originally pink and purple and had blue carpet. 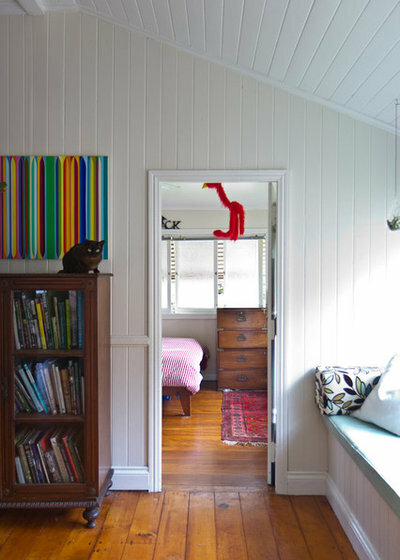 Johanna and her girlfriend took on the challenge to transform it into an inspiring space. They ripped up the carpet, painted the walls white and Derek built the desk. The compact vertical garden was the final touch and provided Johanna with yet another way to bring the outdoors in, and the chairs were another example of her keen eye for roadside finds. 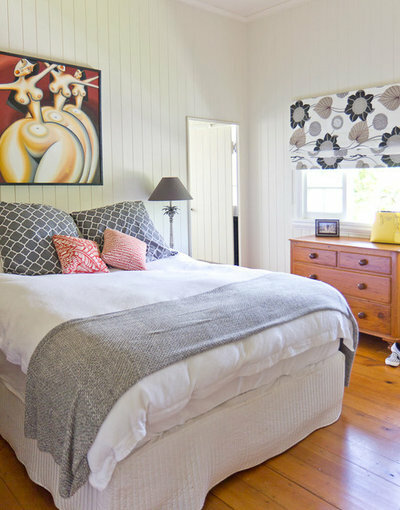 Johanna painted the walls in the master bedroom a crisp white to make the space feel comforting and new. 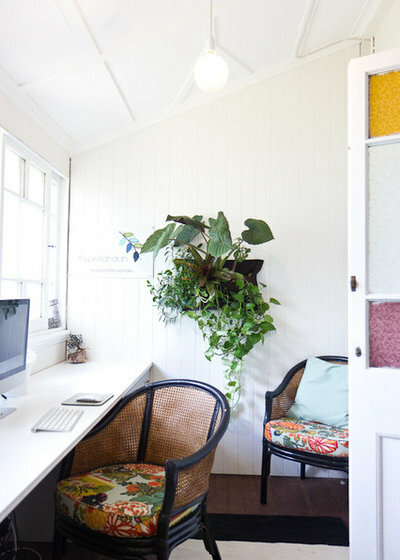 To add interest, she then added a new window covering in a floral pattern. 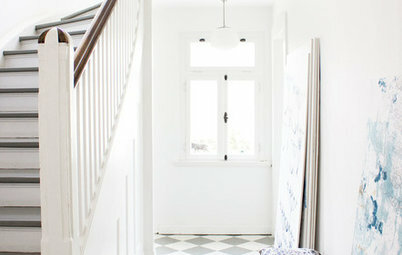 One of Johanna and Derek’s major jobs when renovating was painting over the colourful walls throughout the home. 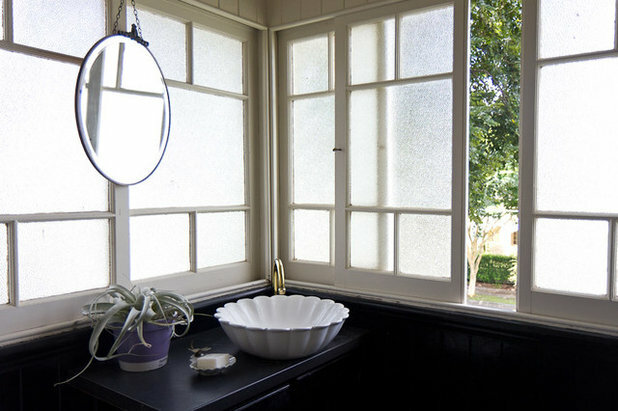 The main bathroom is Johanna’s private sanctuary away from the boys. 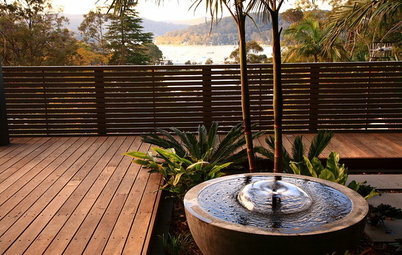 It provides her with a luxurious space to unwind at the end of a long day. 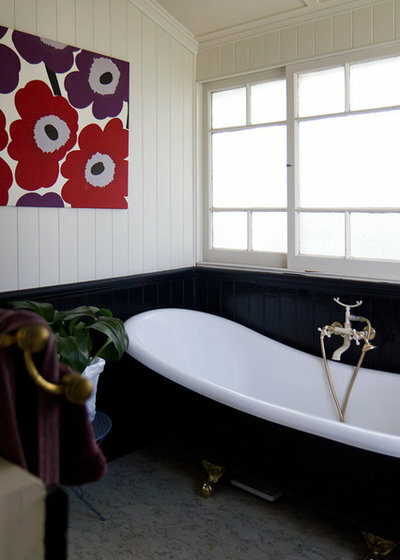 The black paint and claw foot tub are a striking contrast to the Marimekko canvas. 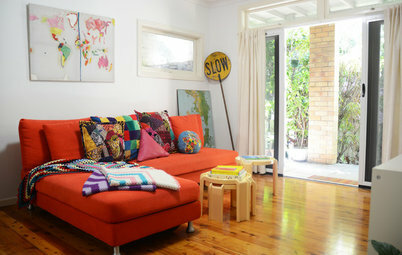 The window seat in the living room is another great spot to soak up the Brisbane sun. 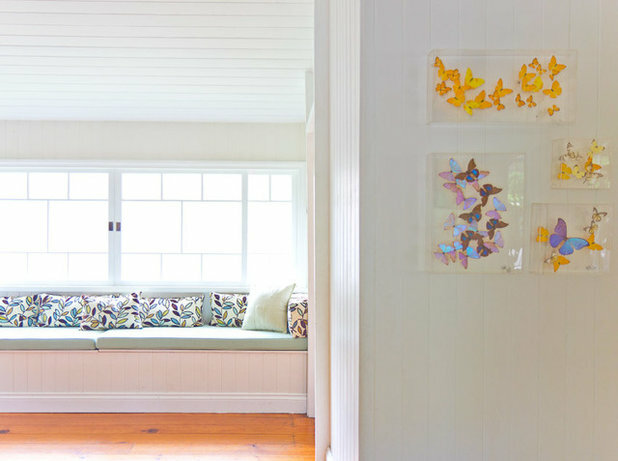 The butterflies are precious vintage items that once belonged to Johanna’s parents. They made the precarious journey halfway across the world from Canada to now sit safely on the walls of her Brisbane home. 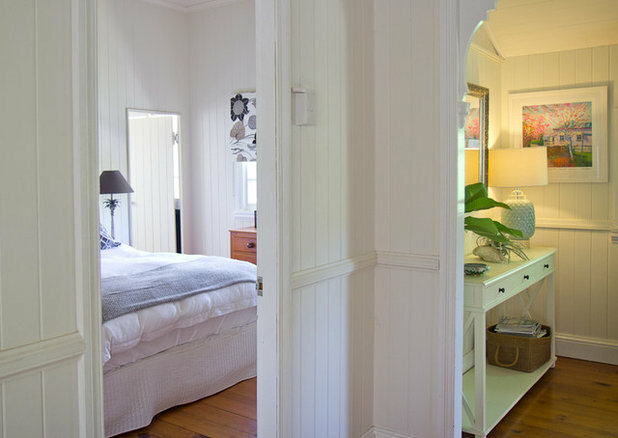 Johanna has many favourite features in the home, including the white vertical join walls and the splashes of colour in the decor. As a landscape architect, Johanna has big plans in mind for the family garden! While she says it’s still a work in progress, she has created a lovely front lawn, shaded by the existing Poinciana tree, for their son, his friends and the dog to run around on. It was one of the first tasks Johanna wanted to complete – to create a green space for Jack. 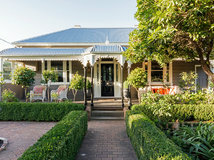 “He spent almost all of the first five years of his life living in a terrace in Sydney’s Balmain with just a courtyard and no lawn,” she adds. 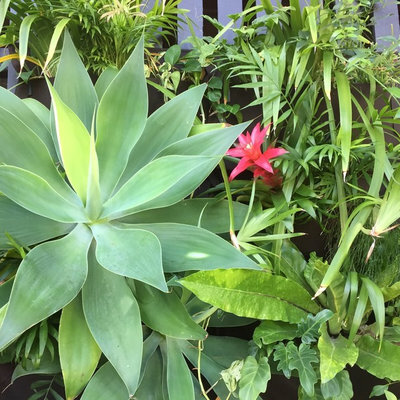 Johanna’s green thumb is clearly evident in this vertical garden, which is secured to the timber battens under the house and adds some colour and life to the wood. 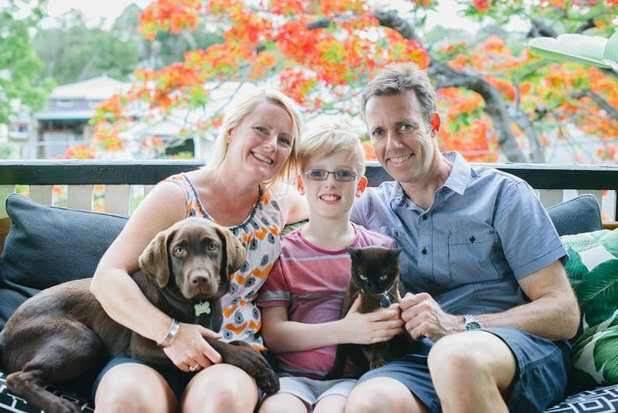 The MacMinn family enjoying their verandah with ‘The Chocolates’ Scout Maple and Betty Boo. 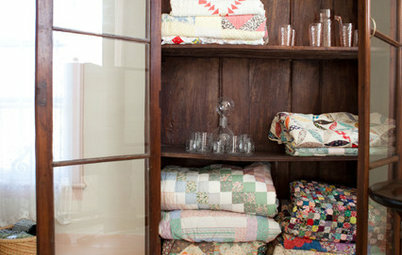 Nothing like a family home collected over time with family and "found" items! So meaningful! 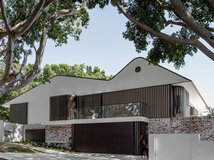 Beautiful house! I could move right in! And I am apparently driving down the wrong roads!! !